And here, my small but growing family of vostoks - any comments appreciated (especially about condition, originality etc.)! sorry for bad picture, the light is down already and taking pics of these shiny objects is a real pain in the xxxx for me. khd and rocketman 333 like this. Current Collection: Rolex Oyster Perpetual, Omega Constellation "Manhattan", Tudor Prince Oysterdate, Rado True, Rado Original, Mido All Dial 90th Anniversary COSC, Longines HydroConquest, Tag Heuer Formula 1 Chrono, Roamer Searock, Poljot Sturmanskie, Vostok Amphibia Ministry, Frederique Constant Persuasion Chrono, Movado Museum Watch Automatic, Movado Series 800 Diver, Tissot T-Touch Trekking, Tissot T-Touch Classic, Victorinox Summit, Citizen Eco-Drive Chrono, Citizen Eco-Drive Super Titanium, Citizen Wingman VI, Seiko 5 Military, Seiko 5 Sports Diver, Casio G-Shock DW5600-E... and counting! IT looks like some religious-esque building, and the wording says "Russia" in Cyrillic if I'm not mistaken. (Used Google translate, hehe). Literally "Vodonepronicaemyje" means " impenetrable to water"
Just picked this up from the post office, got here MUCH quicker than I expected. I'm liking it! Have another on the way, these are really neat! sq100, khd, timanthes and 1 others like this. Courtesy of Amil and Marina - my first Komandirskie. The watch came in much better condition than could be depicted in the images. Thanks! Letchy and OhDark30 like this. jmreynolds, khd, Karsten and 2 others like this. 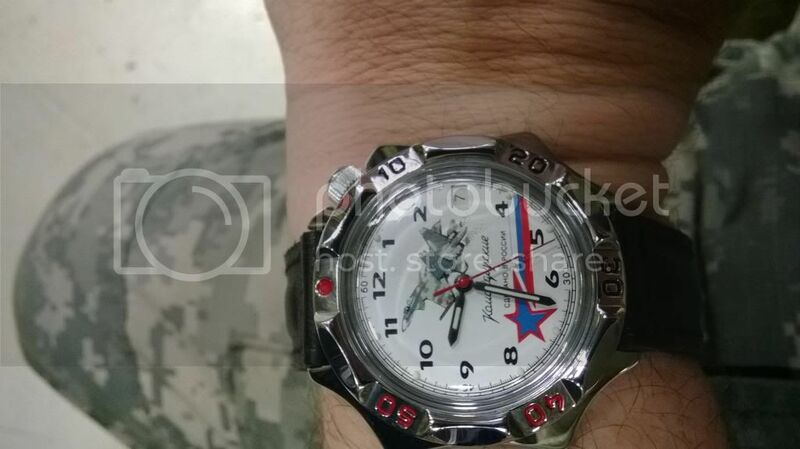 My first was the star shaped, with crown at 13:30 Komandirskie 531124 with a Mig-29 on the dial. On Meranom's hompage the dial looks dark blue, but in fact it is dark green. It is on a Vostok 18 mm mesh bracelet. The next was the Komandirskie 811066 with Su-27s from The Russian Knights (Russian: Русские Витязи, Russkiye Vityazi) Kubinka Air Base on the dial. timanthes, OhDark30, jurgensonovic and 1 others like this.